Nous aimerions partager avec nous votre maison Paradise spacieuse. C'est confortable, entièrement meublé et amusant! Profitez de vos petits déjeuners et dîners sur la grande véranda. Le soir, profitez des couchers de soleil romantiques et géniaux. Pour votre plaisir sur place, vous pouvez jouer au tennis, nager dans une piscine pleine grandeur, tremper dans le bain à remous ou essayer le sauna. Il y a 2 / deux BBQ à gaz et une aire de restauration près de la piscine ou par les courts de tennis. Le condo est à seulement 500 pieds de la plus belle plage de sable doré de Kamaole-1 où vous pouvez nager, faire de la plongée, body surf, etc. Il y a 3/3 centres commerciaux pour faire du shopping et de nombreux restaurants à choisir pour votre plus grand plaisir si vous choisissez de ne pas cuisiner. - Si la réservation est annulée 60 jours avant l'occupation, le dépôt est entièrement remboursable. - Si la réservation est annulée 46 à 59 jours avant l’occupation, 50% du dépôt est remboursable. - Si la réservation est annulée 45 ou moins, le dépôt n'est pas remboursable. Great location, views and spacious! I live on island but since my place is so small, I booked this rental for my parents & grandma for their first 3 nights on island. My family felt very safe and comfortable. It is a great location - my family loved having a relaxing morning coffee on the balcony overlooking the ocean, then enjoyed the 5 minute walk to the beach were they could walk and swim. Close to restaurants and a great pool & hot tub. Although there is an elevator - a few short stair cases are still required to access the condo. It could be difficult for those who have difficult walking. Great communication and very accommodating to our needs and requests! Thank you very much! My family really enjoyed staying at this condo. The views from the lanai were incredible and the windows and mirrors filtered light throughout. There were lots of great amenities and the kitchen was well stocked with what you need to stay in for meals. Wonderful local restaurants and the beach just down the street within walking distance. We would stay here again in a heartbeat! Thanks Silvana! Silvanas condo is purely amazing! It has everything you need from kitchen ware to boogie boards, beach chairs, amazing location. The hot tub and pool were a major hit with our family, after a long day of the beach or exploring we would soak our bones in the hot tub while our daughter played in the pool. Silvana was very easy to communicate, always there when I had a question with quick response. The location couldnt br kore perfect! It is literally 2 mins to Kamole 1, surrounded by restaurants, general store, a natural store and foodland is only a 15 mins walk. The wifi was excellent. One room had a king size bed and in addition the loft had a king bed and a single bed. The beds were very comfy as well as the pillows. I suggest reading the reviews they speak for themselves and have amazing tips :) we will definelty be back to this condo I'm the future !!!! Really enjoyed our stay. Condo is well equipped right down to the beach chairs. Complex is well built and the grounds maintained. Cool breezes come down the mountain and keep the temperature down. Highly recommend to stay here. There are some stairs to climb, so people with mobility issues will have difficulty. Otherwise, unit is great, owners are great! Mahalo! 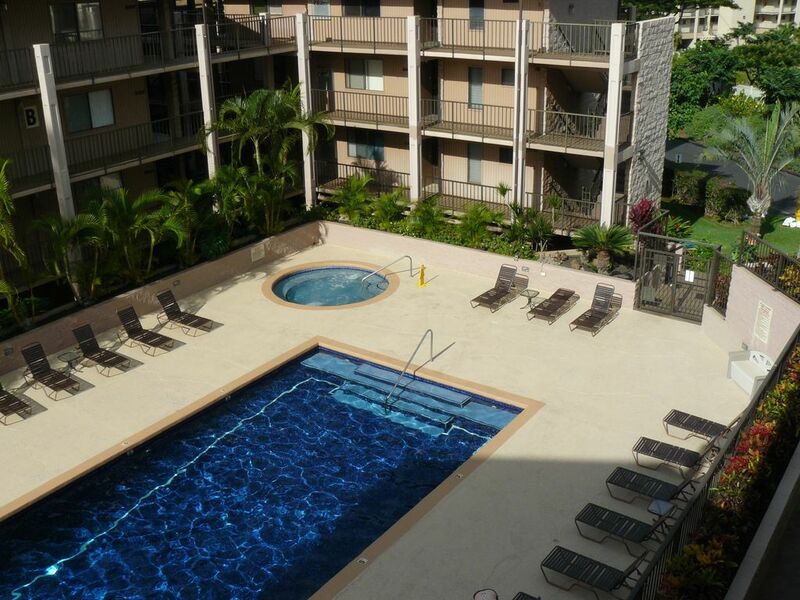 WELL-LOCATED: This unit is an easy 5 minute walk to Kamaole I beach park which has both a beach and a lawn, shops and restaurants. It's also only about a half hour from the airport when you arrive. WELL-STOCKED: All beach supplies you could want -- towels, chairs, etc., were available. The kitchen had all manner of cookware and even some basic cooking ingredients. WELL-KEPT: Clean and tidy, nice decor. Washer/dryer in-unit were very useful! Of course the views were excellent as well! Some things to note: The lanai is best enjoyed early morning and late in the day; there's no shade from the sun after about 9 am. If you go with a toddler, note that the door to the bedroom doesn't have a lock, so your tot may try to walk around including the stairs to the loft if you don't keep an eye on them. Also: there are many steps to access the unit, and not all in a single place either; the complex has a somewhat zig-zag layout in order to reach the unit, but once you get the hang of it you'll appreciate the layout, designed to maximize everyone's views!